Let this multi-functional bar cabinet/sideboard inspire you! It’s perfect for mixing a cocktail that appeals to you or indulging your passion for great vintages. 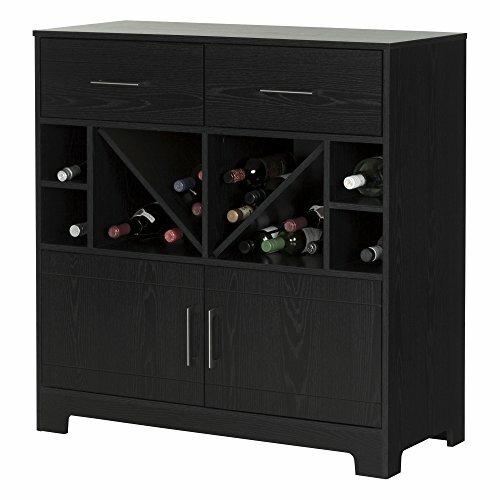 The specialized storage spaces, designed specifically for wine and liquor bottles, in conjunction with the handy drawers (ideal for accessories) mean everything you want to entertain your friends in style is right there at your fingertips. Because it’s so versatile, you’ll be able to just remove the diagonal shelves, and presto!… you’ve got a storage unit for your entryway or living room. Storage for up to 32 bottles of wine (to per small square space, 6 per triangular space). Remove the diagonal shelves for more versatile storage or to put baskets. Vinyl coated top tray, damage resistant. 2 handy drawers with metal slides. In the back of each and every door: 1 storage space. Elegant metal handles in a Brushed Nickel finish. Can be utilized with South Shore baskets (8050140). Drawer dimensions #1: 20” (L) x 13.6” (D) x 5” (H). Drawer dimensions #2: 20” (L) x 13.6” (D) x 5” (H). Shelf #1 dimensions: 16.6” (L) x 16” (D). Shelf #2 dimensions: 5.5” (L) x 16.7” (D). Meets or exceeds all North American safety standards. Baskets and other accessories not included. Requires complete assembly by 2 adults (tools not included). 39.625” (L) x 17” (D) x 40.25” (H). Box dimensions: 59.22” (L) x 17.8” (W) x 7.17” (H), 126 lb. Ships in a heavy box, be sure to have a friend with you. Packaging tested and certified to reduce the risk of damage all through shipment. Made in North The united states with non-toxic laminated particleboard. 5-year quality guarantee. Any questions? Contact the manufacturer, to be had 7/7 by phone, email or chat.